There are a couple of really good reasons for me to be thinking about love, marriage and all that mushy good stuff right now. Just a few weeks ago Hubs and I celebrated our 8th anniversary. Ahhh I can’t believe it’s been 8 years. It’s hard to remember a time when he wasn’t by my side. This year when I was thinking of all the ways I love this awesome partner and friend of mine something really struck me. This is what I want for my kids. I want them to be loved, respected and supported. I want them to search out and require a healthy love. For them to know how to be a spouse and to feel as loved as I do. There are some little ways we can make sure our message of love is received loud and clear. Make alone time a priority. That doesn’t have to mean a big night out on the town (although it can. ;)). Date night can be as simple as having the kids play in their rooms before bed. We call it bedroom rest time and make it clear that it is as important for them as well as for us. It’s okay… and beneficial to say “Dad and I want some adult time. So we can spend time together by ourselves.” Let them know that husband-wife time is just as important to you as the time you spend with them. Be affectionate. Cuddle, hug, hold hands and even kiss in front of the kids. They love hugs and snuggles… it’s an important part of the connection we make as parents. And it’s an important part of the connection we make as a couple. Tell the kids how great he is. Make a point to share what makes you swoon. I’m a big advocate of speaking up, especially in a positive way. If I notice that Hubs did something extra special I shout it out. Disagree in front of them once in a while. I know, I know… you’ve heard a hundred times that you should not fight in front of the kids. I agree with that. BUT we are not perfect and we do not agree all the time. A healthy marriage is not one that only consists of smiles and laughs. There are times when you don’t see eye to eye and letting the kids see a HEALTHY, calm disagreement will show them how to argue respectfully. Give each other little gifts of love (and let the kids help). Make notes to put in his lunch box or under his pillow. While it will let the kids show him some love it also shows that putting a little smile on his face is important to you. Have fun together. Be silly and enjoy being around each other. Keep some of your interactions light and playful. Show the kids that you are friends. That you just plain like each other. 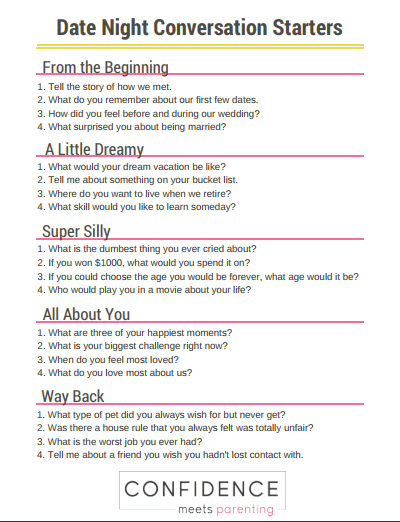 This list of romantic mini-dates (that can happen right in front of the kids) has quite a few fun ideas. Related: Fun Activities for Couples (that take ZERO planning). 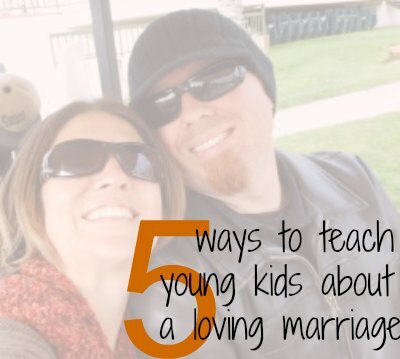 What tips for teaching kids about healthy marriage would you add? Let us know in comment section. I think go kart racing would make an awesome date! I love that you included disagreeing as a way to help kids know what a healthy marriage looks like. I loved that my parents were up-front about not agreeing on everything, but also very upfront about loving each other and being one hundred percent committed to the relationship. Happy Anniversary! I also believe strongly in modeling a healthy marriage. Thanks for sharing this list! I know Cerys 🙁 I wish you could enter too! I love all their “stay in” ideas….we have 3 kids and it’s impossible for us to get out so these would be perfect! These are great tips, Jill! And the coupon book is adorable. That proposal just made my cry!!! My hubby is staying in a hotel for a week at a time every other week and this started last week so our time together is very special right now and would love a few date night fun ideas! 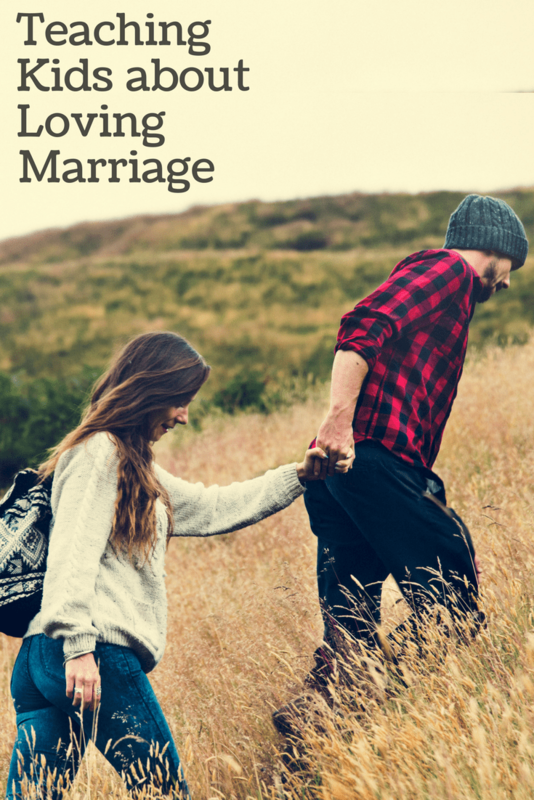 Thanks for linking this with Marriage Minute! River rafting sounds like so much fun – though my hubby would love the paintballing one! Hi! Wow! Those are some awesome ideas, thanks for sharing!! I love this post and that fact that you took time to share how important it is to appreciate your co-parent and share that love with your kids. I love being reminded to give me man all that he deserves and to make it a part of life with kids too..
… Both of my kids are very little still (2.5 and 8 months) but both are already able to have time on their own, either in their room before bed/when they wake up or in the kid room while the adults are working on something else. We both PLAY HARD with our kids, but I appreciate knowing that they can be with themselves too and that they understand, even at their young ages, that mom and dad have time for themselves and each other too. My toddler knows that the hall light goes out when mom and dad go to bed and she told me that makes her feel safe. I love it. LOVE IT! Thank you so much for sharing your story. What an awesome way to start out your family… playing hard together and respecting each others time and space. I love these points. What you wrote is very important for both teaching the children about marriage AND keeping the marriage alive. We love making each other small presents and our older daughter actively participates in gift-choosing! What a super cute idea! The stick figures are adorable! Thanks for sharing this site. : ) This would be a great Valentine’s surprise for my husband! I LOVE this idea!!!! I always teach my example is the best way. Love your post! Not having a personal example to follow (my parents were divorced when I was very young), I am happy my children can see the Hubs and I being a real couple. I like the idea of making a point to have alone time, and not just after the kids go to bed. Great post! Thanks Kelly, and thanks for sharing your story. This is such a great post! Thank you for sharing! This was great, but the two I saw missing was communication, where one is talking and the other is listening. So to show your child, when your husband is talking, you give him your undivided attention; it is hard with kids in the house, but important to a marriage. That leads into the second which is showing him respect as head of household, it doesn’t mean that the women has no control or say, you are still a team, but you both need to show respect and the kids need to see that to show a team that works cohesivively and as a tag team. It is important to the children. Great post, keep up the good work.